Art Vinyl as Affordable Art – Celebrate Valentine’s Day. This is the latest Art Vinyl ‘seasonal’ window installation running throughout February. Being on the spot in London, can provide the perfect selfie backdrop to celebrate Valentine’s Day. 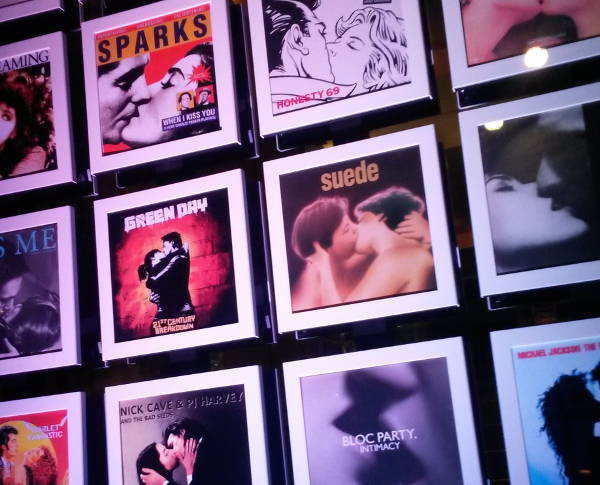 The installation features 24 stunning kissing record covers but pretty sure there’s plenty more out there in your own record collections. Art Vinyl was founded in London, England in 2005. Art Vinyl is the original way to display your favourite vinyl records. Perfect for music or art enthusiasts and those with an eye for stylish interior design. The first real champions of Art & Design for vinyl records. Art Vinyl also curate exhibitions celebrating the best in sleeve design. The unique Play & Display Flip Frame gives the chance to stylishly display favorite vinyl albums or 12″ singles and their contents on your wall. With this record frame’s unique design, can also change over the display within seconds, without having to remove the frame from the wall. The Flip Frame has a unique quick release system; simply press the catch at the top and they hinge open. As a fan of Art Vinyl may expect to enjoy their Play & Display products for a lifetime as they can change the display over time, as they change or they discover more vinyl art.